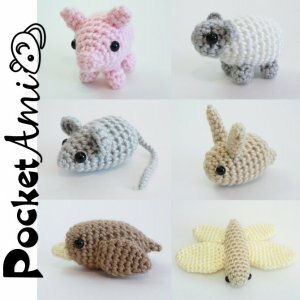 Six original mini crochet amigurumi patterns (Mouse, Pig, Bird, Bunny, Sheep, Dragonfly) from the PocketAmi range by June Gilbank. Purchase PocketAmi Sets 1 & 2 together and SAVE. Date Added: 11/05/2013 by Angela N.
Date Added: 08/12/2012 by Carrolyn A. Date Added: 05/16/2012 by Ruey T.
Date Added: 05/13/2012 by Simone N.
Date Added: 04/28/2010 by Holly L.